France is rated 4.7 out of 5 based on 32 verified reviews from YGT customers. They played and stayed (we even checked they signed their scorecards). With the advent of the Eurotunnel, the already well-known resort towns of Le Touquet and Hardelot, and their phenomenal golf courses, became even more accessible. Just a short drive inland are some superb golf resorts as well. These include, most notably, St Omer, with its outstanding hotel and a superb championship 18-hole course plus a friendlier 9-hole track, and Arras, a nice town with a golf club and hotel that's worth a visit. Paris and its majestic surroundings are home to comprehensive resorts like Dolce Chantilly, and famous tracks such as Fontainebleau and Golf National, while heading west to Normandy, Brittany and the Western Loire, the coastline is dotted with charming courses and holiday towns. Trouville, Deauville and La Baule are perfect for a golf and beach holiday, especially if you like a bit of evening action, as they are crammed with restaurants, bars and the odd casino. 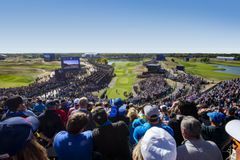 Building up to the 2018 Ryder Cup matches at Le Golf National, situated on the outskirts of Paris, France is in the throes of golfing revolution. The courses are more and more accessible and there is value for money across high quality destinations that may just surprise you. Short, cross-Channel escapes remain popular with our golfing friends based around London and the south coast, but France has something to offer almost any golfer based in the UK and Ireland. Indulge your passion for golf whilst savouring the inimitable cuisine, culture and ambience that can only be France. The north of France, where many of the country’s best golf offerings are located, experiences a similar climate to the south-east of England. As with many holiday locations in Continental Europe, the further South you venture, the warmer it tends to get, with the Cote D’Azur enjoying a beautiful, sunny Mediterranean climate for much of the year. The months between April and October are generally the best for golf. The L’Albatros Course at Le Golf National has hosted 22 of the last 24 Open de France’s and is set to host the Ryder Cup in 2018. Previous winners of the country’s national championship at the venue include Colin Montgomerie (2000), Martin Kaymer (2009), Miguel Angel Jimenez (2010) and Graeme McDowell, who successfully defended his title in 2014. The Northern Irishman’s winning total of 5-under highlights the difficulty of the test presented by L’Albatros. La Mer at Le Touquet Golf Club is another brilliant championship layout which has hosted the Open de France on six occasions. You can also find tour quality golf at the Aa Saint-Omer Golf Club, which has hosted the Saint-Omer Open annually since 1997. The event was formerly a fixture on the European Tour schedule before reverting to the Challenge Tour calendar in 2014. Groups will love the variety of golf offered at Le Touquet, with the links of La Mer (a former French Open host) perfectly complimented by the tree-lined La Foret. The outstanding Golf Barrière de Deauville has 27 holes on site with another eight courses to choose from - visitors can take advantage of great group offers including a half-board option. Hardelot boasts two of the best courses in France and is easily accessed from a selection of group-friendly hotels. Reims is romantic city with plenty to do, including visiting the famous Champagne houses. Stay at either L'Ailette or Grand Hotel des Templiers to explore the region’s delights. Dolce Chantilly is a comprehensive resort with great leisure and dining options. With Paris just a short train ride away, you can golf by day and visit the sites in the evening. With it’s cobbled streets and quaint restaurants, Montreuil is a great town to visit - stay at Hotel Hermitage and play at the outstanding Golf de Belle Dune or the courses at Le Touquet. If the night out is just as important as the golf, head to the vibrant coastal town of Le Touquet. The streets are lined with bars, clubs and restaurants, plus there’s a casino if you feel like testing your luck. Biarritz, tucked away in the south west corner of the country, is a real party town. Here you’ll find countless beach bars, clubs, restaurants and casinos. But the undisputed party capital of France has to be Cannes, where exclusive bars and restaurants line the world-famous La Croisette. The Grand Hotel Dinard is a truly “Grand” venue, boasting unrivalled service and quality with the beautiful town of Dinard on its doorstep. The Ermitage Hotel Evian is a masterpiece nestled at the foot of the Alps which welcomes the Evian Championship - the fifth and final major on the Women’s PGA Tour - every year. The quality of the course is matched by the outstanding accommodation on offer. Exclusivity is the best word to describe the amazing hotel, spa and golf resort at Terre Blanche in Provence - a must go to destination!